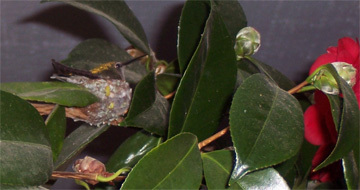 When we returned from our “Spring Break” vacation at the end of March, we found that a hummingbird was busy building its nest in the camellia bushes just a few feet from our front door. I’ve been taking photos when the parent is away. Come take a look. I’ll update with new photos from time to time. This is about the exact size. 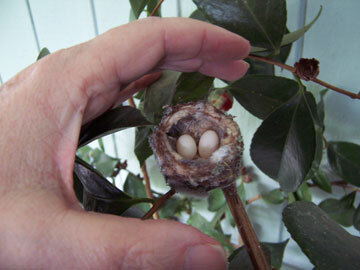 The nest is about 1.75″ from outer edges. Notice how the mother has decorated the nest with bits of licken and fuzz. These hatched a few days ago. My hand near the hummingbird nest, to give you idea just how tiny this nest is. The eggs are about the size of jelly beans. I have put out hummingbird feeders so the mother won’t have to travel far for nourishment. We often have such nests in our shrubbery. Once Scott went to check on a nest and noticed one baby was gone. While he watched, the second fledgling took flight! THAT was sure a lesson one would be hard put to learn in a classroom! Hummingbirds are the smallest birds on the planet! Because of their small size, hummingbirds are known to have predators.